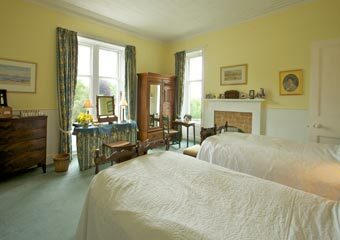 Country house bed and breakfast accommodation in Southern Scotland. The Annandale Way as it passes along the Water of Milk is less than half a mile from White Hill. 3 miles from Junction 16 , Ecclefechan, on the M74. White Hill is an old-fashioned Victorian house in lovely surroundings with warmly welcoming owners, Robin and Janet Bell-Irving. 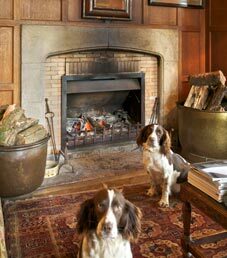 It's their family home, with spacious rooms full of interesting paintings and objects, and the scent of wood-smoke from the open fire in the oak-panelled drawing room. 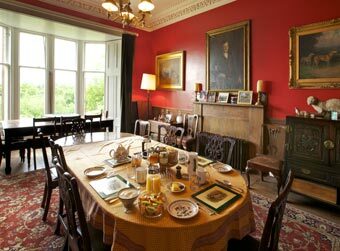 Though there may be some paint-chips and the occasional threadbare carpet elegantly worn by time the house is comfortable and is certainly a rare opportunity to stay for bed and breakfast in a genuinely atmospheric Scottish country house. As soon as you have passed between the stone gate piers along the drive which curves round the the front of the house there's a real sense of seclusion and rural peace here. Below the house is a pond teeming with wildlife, and old stables with horses in fields beyond. 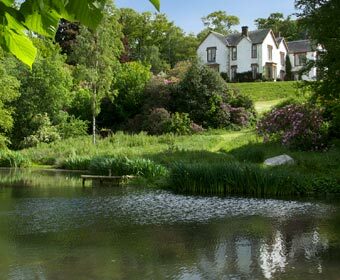 All around are masses of shrubs, mature woodland and an astonishing variety of rhododendrons, and you could almost get lost in the woodland walks. There is also a (hard) tennis court at White Hill. And, while you are having breakfast, you may (more likely than not ) see red squirrels on the bird table. 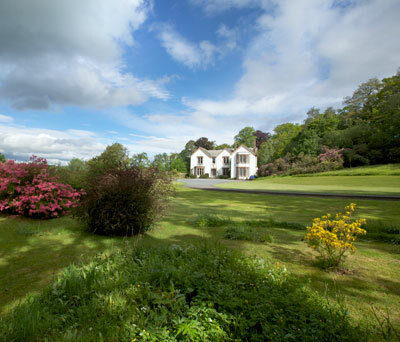 White Hill is also an excellently located base for golf, fishing and exploring the wonderful variety of landscape, gardens, castles and historic sights in the Scottish Borders and South West Scotland. And if you're driving through Southern Scotland how much more convenient could only three miles from the main North-South M74 be? But if you stay here for just one night you would probably wish you had stayed for more! 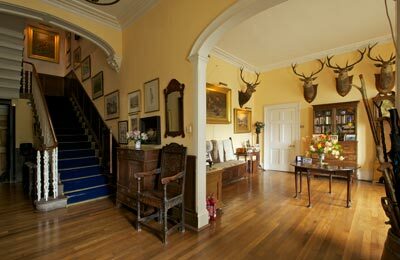 From the entrance hall (above right) adorned with stags' heads, the stairs lead up to the bedrooms. 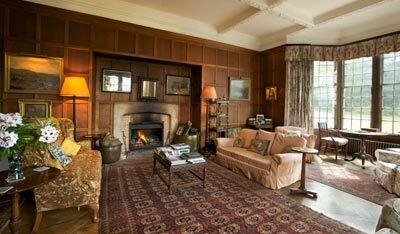 Another door opens onto the light and open drawing room (right) where you are welcome to relax by the open wood fire. Twin bedroom with windows looking from the front of the house and over the stable roof, pond and views across distant fields. 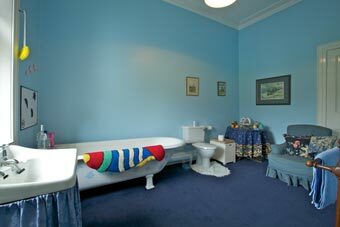 The bathroom is en suite and has a bath, basin and wc. There are no showers at White Hill but the baths are long, deep and extremely relaxing. Twin bedroom. This is Robin and Janet's daughter's bedroom which is for guests when she's not at home. 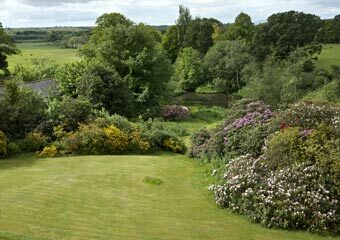 The view is from the front of the house over the drive to woodland and fields. 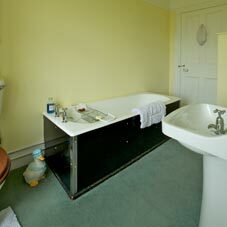 The bathroom is en suite and has a large original cast-iron roll-top bath, basin and wc. There is a further bedroom (not shown) with twin beds/kingsize-double bed. It has private bathroom a few steps away. Tea, coffee, toast, marmalade, jams. Fruit juice and fresh fruit salad. £98 per double room per night, for 2 people, including breakfast. 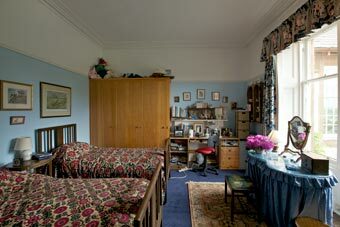 From £60 per room per night for a single person in a twin room, including breakfast. Children welcome. A further twin bedroom is sometimes available. Dogs are welcomed – by arrangement. No smoking please. View across the pond to the house. There are many delightful walks in the grounds of White Hill. Please tell Janet and Robin you found White Hill through About Scotland!